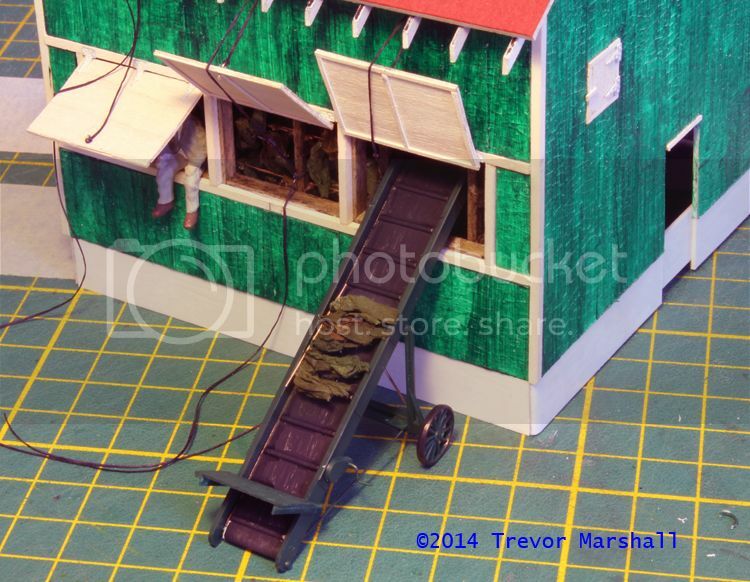 This entry was posted in figures vehicles and other details, scenery, St Williams tobacco kilns, structures by Trevor. Bookmark the permalink. It’s always nice to see your progress. It’s looking good! 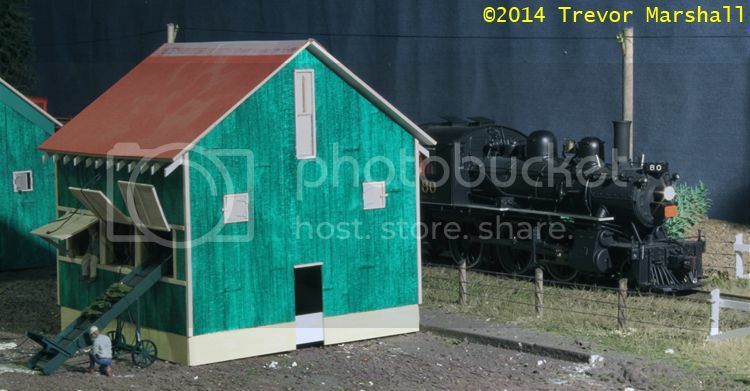 Those sheds sure are an ‘interesting’ shade of green. Thanks Brian – and the shade will change by the time I’ve weathered them. Cheers! Given the hand crank on the conveyor, with the machinery guard on the crank handle,(with chain and sprocket drive) it would take a ‘month of Sundays’ to elevate the tobacco to the kiln. One person would be winding furiously while the others loaded the conveyor. An electric motor on the conveyor powered by a local supply or a small generator may have been employed, other wise it would have been more ‘financially’ benefit to throw the tobacco to the kiln man. but then again it is your layout. I have an ice cream maker from that era and it’s hand cranked. It takes 20 minutes of constant, furious cranking to make ice cream – which explains why the instructions say, “Get a couple of the neighbourhood kids to crank it”. It also explains how one can eat home-made ice cream and lose weight. Seriously though: Good point although you assume that the crank is the only means of operation. I included the crank because my prototype has one: check the recent posts on the kilns and you’ll see a conveyor in a postcard view. There’s a motor supplied in the kit. It’s a blob of plastic. Before I add it, I’m waiting to hear from someone who worked the tobacco harvest. He can tell me how the conveyor was powered, so I can correctly model it. I have more info now – and will make some mods and additions to the conveyor and then post the results. Stay tuned! perhaps something did not update correctly??? After posting it I decided it would be better as an addendum to the post on reworking the kiln interior – so I did that and deleted the post. Sorry for the confusion. Glad you enjoy the blog.